Juniper Street is a major arterial in Midtown Atlanta. 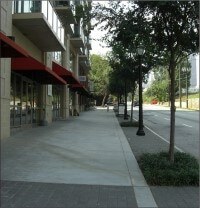 The street acts as a transitional area between the high-density mixed uses along Peachtree Street and the medium- to low-density residential uses along the historic Piedmont Avenue corridor. The street contains a variety of uses and building types, ranging from modern high-rise office buildings to single-family Victorian homes. Recent development trends have resulted in increased medium-to-high density multifamily uses along the street. As part of an effort to calm traffic, improve the pedestrian environment, and reduce visual clutter, TSW was retained by the Midtown Alliance to develop a streetscape plan for this important Midtown street. By working in conjunction with City of Atlanta officials, affected neighbors, and property owners, TSW created a design which provides bike lanes, on-street parking, street trees, and improved pedestrian crossings and sidewalks within the existing right-of-way. The plan also includes transit improvements, traffic calming, and traffic flow changes that will transform the street from one that repels and divides to one that attracts and connects.